This article originally appeared in Issue # 2 of our print magazine, in August 2016. Queensborough has seen a major population boom in the last 10 years, and with good reason! This family-friendly neighbourhood has a multicultural vibe, some of the more affordable housing prices in the lower mainland, and many hidden gems that are loved by its residents. With a nice mix of single family dwellings, townhouses, condos, and apartments, Queensborough is a neighbourhood that many young families have come to call home. 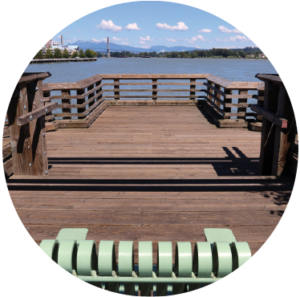 Built along the Fraser River, surrounding the Port Royal neighbourhood, lies a boardwalk perfect for morning runs, afternoon bike rides, and evening sunset strolls. Gardens, benches, and a gazebo are dotted along the boardwalk where you can enjoy views of the mountains, bridges, and New West Quay. Every Canada Day near sunset, you’ll find families staking out a spot to watch the fireworks over the river. You won’t find a better place to take in the sights and sounds of the celebration. The City has plans for a pedestrian bridge that runs from Port Royal to the Quay, tentatively scheduled for construction in 2016/2017. Located at the northwest end of the Port Royal boardwalk, this sandy area along the Fraser River has been informally named “Hidden Beach” by area residents. A delightful spot to spend a sunny afternoon, you’ll often find families with picnic blankets and sand toys enjoying one of the few beaches New West has to offer. The area is quite small, and only accessible via the boardwalk, so you’ll want to get there early if the weather is nice. 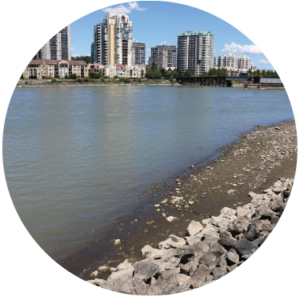 The Fraser River’s current is quite strong, so we advise users of Hidden Beach to avoid the temptation of cooling down in the river. 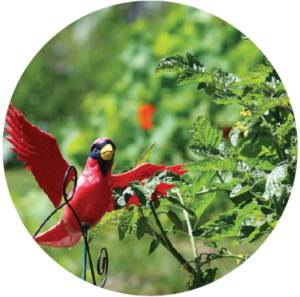 Located on the hill overlooking Port Royal, lies the Port Royal Community Garden. Surrounded by blueberry bushes, apple, pear, plum, and fig trees, the community garden is a lovely setting to visit after a stroll along the boardwalk. It’s fun to see the wide variety of fruits and vegetables being grown by locals. The garden also contains two plots where food is grown for the food bank. The Port Royal Community Garden Association is active in the community and participates in a variety of events, including the Queensborough Children’s Festival held each June. They also host an English Tea Party in the garden during the New West Cultural Crawl in August. Known to many Queensborough residents as simply “the waterpark,” Ryall Park is a hub in the Queensborough community. 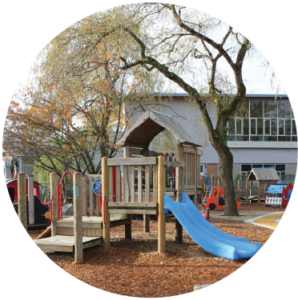 Located next to the Community Centre, between Queen Elizabeth Elementary School and Queensborough Middle School, it is a central meeting place for many families. From Victoria Day until Labour Day, you’ll find the water on in the spray park and locals of all ages shrieking with delight as they run through the cool water. During summer break, a playground attendant is on duty who leads children in free crafts and activities. The park is a go-to place for summer celebrations. On most weekends you’ll find multiple birthday parties happening there as family and friends gather to celebrate. Ryall Park also has sports fields, a tennis court, picnic tables, a picnic structure, and playgrounds. During a recent upgrade, the Boro All Wheel Park was added to the grounds—a 12,000 square foot park for skateboarders, in-line skaters, BMXers, and mountain bike enthusiasts. Complete with a concrete bowl, street course, and 120-metre long BMX track, you won’t find a park like this anywhere else in the Lower Mainland. 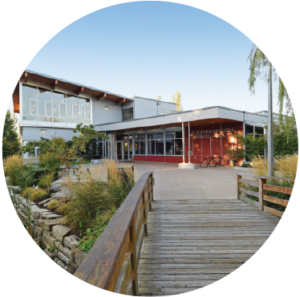 The Queensborough Community Centre recently underwent a massive renovation and expansion and is the first civic facility in New Westminster to be certified LEED (Leadership in Energy and Environment Design) Gold. Not only is the new community centre beautiful to look at, it also houses a new city library branch, a commercial kitchen, an art gallery wall that is rotated monthly, and state-of-the-art fitness facilities. Though located within Ryall Park, Megan’s Place deserves a mention of its own. Named in honour of three-year-old Megan Gunderson, a Queensborough resident killed by a hit-and-run driver in 1996, Megan’s Place is a tribute to this sweet soul who was lost too soon. The playground is filled with equipment that encourages young children to use their imaginations: the large train will have kids imagining they are conductors in faraway lands, the wooden fire engine will have them dreaming of being a firefighter who has saved the day, and the porch of Megan’s cottage is a fun place for kids to hang out pretending they are camping deep in the woods. Megan’s family still lives in Queensborough and is involved in the Teddy Bear Picnic to honor Megan, which is held each summer during the Queensborough Children’s Festival.